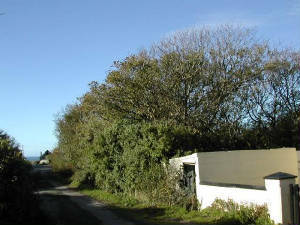 Habitat: Sea-cliffs and mixed farmland (mainly pasture) with gardens and scrub, overlooking Tramore Bay. 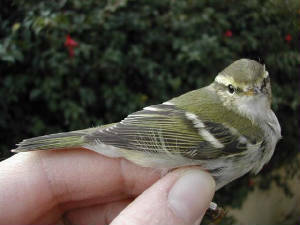 Main interest: Landbird migrants (March-May, Aug-Nov); seabird passage (all year, especially Apr-Sept). Typical birds: Manx Shearwater, Gannet, Kittiwake, auks (mainly spring & autumn); Chough, Stonechat, birds of prey (all year); passerine migrants, especially hirundines, Skylark, Meadow Pipit, Wheatear, common warblers, Goldcrest, finches (spring and autumn); divers and Common Scoter in adjacent Tramore Bay. Regular/annual (subject to coverage): Sooty Shearwater, Merlin, Arctic, Pomarine & Great Skua, Black Redstart,Whinchat, Reed & Garden Warbler, Pied Flycatcher. Scarcer species & rarities: Great & Balearic Shearwater, ‘Blue’ Fulmar, Leach’s Petrel, Hen Harrier, Ruff, Green Sandpiper, Grey Phalarope, Glaucous, Mediterranean, Little & Sabine’s Gull, Black & Roseate Tern, Little Auk, Short-eared Owl, Turtle Dove, Hoopoe, Wryneck, Tree Pipit, Redstart, Ring Ouzel, Lesser Whitethroat, Icterine, Melodious, Barred, Yellow-browed & Wood Warbler, Firecrest, Red-breasted Flycatcher, Woodchat & Red-backed Shrike, Golden Oriole, Rose-coloured Starling, Brambling, Hawfinch, Common Rosefinch, Lapland Bunting. See IBR records. Best birds: Yelkouan-type Shearwater (August 2010), Iberian Chiffchaff (June 2010), Subalpine Warbler (May 2008), Tawny Pipit (April 2008), Little Bittern (April 2008), Bluethroat (Oct 2006), Greenish Warbler (Aug 2006 & Oct 1995), Western Bonelli's Warbler (Oct 2005 & Sept 1981), Pallas’s Warbler (Nov 2003), Northern Parula (Oct 2003), Scops Owl (Apr 1998), Yellow Warbler (Oct 1995, 1st Irish record), Blackpoll Warbler (Oct 1993), Red-eyed Vireo (Oct 1985), Sociable Plover (Dec 1909), Stone Curlew (March 1840). Access: Brownstown Head can be approached from Dunmore East by following the coast road carefully towards Ballymacaw; continue coastwards from there for almost 3 km and then take a left turn at the cross roads, just after the Sandhills and Tramore Backstrand come into view. 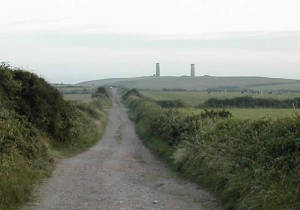 From Tramore, Brownstown Head is 14 km away to the east. 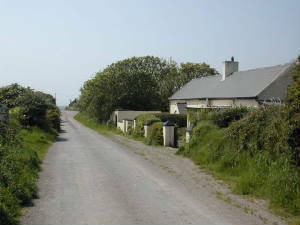 Turn off at Pickardstown on the main Waterford-Tramore road, follow the sometimes narrow and winding road that skirts Tramore Backstrand, veer off right just beyond Corbally church and proceed along that straight road to the Head. Access from Waterford is straightforward using this route, once you are on the Tramore Road. Alternatively, take the airport road from St. John’s Park in Waterford City; beyond the airport, turn left (right for Tramore) and keep on straight, past Murphy’s pub at Clohernagh and then beyond Corbally church veer right for the Head, almost 5 km away. It is possible to drive down the boreen at Brownstown but turning can be awkward. Preferably, park the car near the ruined farmhouse buildings and access the Head by foot from there. 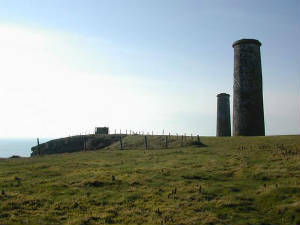 As a site for observing good numbers of both seabird and landbird migrants on the Waterford coast, Brownstown is equalled or approached only by Helvick Head, further west. Situated at the south-east corner of Tramore Bay, Brownstown projects almost as far south as Hook Head, Co Wexford, to the east, and compares well in the range and numbers of migrants recorded over the last few decades. 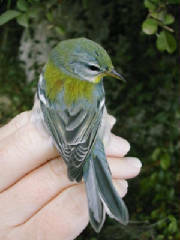 Most notably, the site has produced records of four North American passerine species. Ideal conditions for seawatching at Brownstown are onshore winds, from between a south-easterly and a south-westerly direction, especially with reduced visibility in mist or rain. Some shelter from the elements is available inside or behind the World War II observation hut on the tip. From spring to autumn, Manx Shearwaters, Gannets, Kittiwakes, Guillemots and Razorbills are the most abundant species, with occasionally a thousand or more passing per hour. Even in mid-winter, large Kittiwake and auk passages are occasionally recorded. Other species including divers, Common Scoters, Sooty Shearwaters and skuas are fairly regular at the appropriate seasons. Common Porpoises too have often been seen offshore during seawatches and there have been records of Killer Whales and Risso’s Dolphin. On land, the most obvious migrants are usually Swallows, Skylarks and Meadow Pipits, which can be seen passing east or west overhead, especially in September and October, sometimes several hundred in a few hours. These are often accompanied by smaller numbers of Sand Martins, and occasionally by a Turtle Dove, Yellow Wagtail or Tree Pipit. 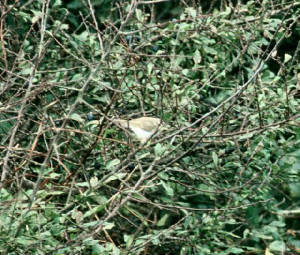 Finch movements (Chaffinch, Redpoll, Siskin) also occur, in late autumn. 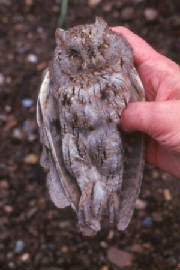 Nocturnal migrants are usually fewer in number and less obvious, and may require patient and careful searching of suitable cover, especially the gardens and hedgerows. Optimum conditions are after south-easterly winds from late March to early June and from late July to mid-November, when commoner migrants and the odd rarity pass through. An excellent place to start looking is at the gardens at the south end of the access road to Brownstown, just before the dirt-track which leads down to the Head. The dense cover in the gardens provides good shelter and feeding for species attracted to trees and willow scrub, and is the most productive patch for night-migrants on the headland. With patience, most birds can be seen from the adjacent roadside or track. Over the years, scarce or rare species recorded here in autumn, sometimes staying around for a week or more, include Redstart, Tree Pipit, Bluethroat, Lesser Whitethroat, Reed, Icterine, Melodious, Barred, Western Bonelli’s, Pallas’s and Yellow-browed Warbler, Iberian Chifffchaff, Firecrest, Red-breasted & Pied Flycatcher and, from North America, Red-eyed Vireo, Yellow Warbler and Northern Parula. 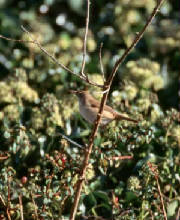 Coverage along the main track towards the tip of the head, with occasional binocular scans along the hedges of adjacent fields, will usually reveal some common migrants in spring or autumn, including Whitethroat (which also breed in good numbers). 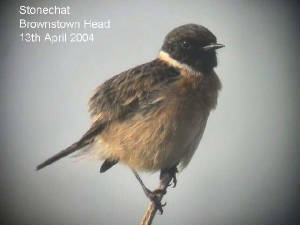 Whinchats are most likely to be seen here. Rough tracks can be followed across several of the fields bordering the boreen, and by keeping to the extreme margins of the fields it is possible to systematically search the hedgerows for birds. In this part of Brownstown, small migrants often flit ahead of the observer along the hedgerows (or bury themselves deep in cover! ), but a careful or sit-and-wait approach can be rewarding. Black Redstart, Blackcap, and Garden Warbler are the most frequent ‘scarcities’ here, but Wryneck, Firecrest, Red-backed Shrike, Lapland Bunting, Lesser Whitethroat, Reed, Icterine, Melodious, Barred and Yellow-browed Warbler have all occurred, with Blackpoll Warbler, Little Bittern, Tawny Pipit & Subalpine Warbler the highlights. 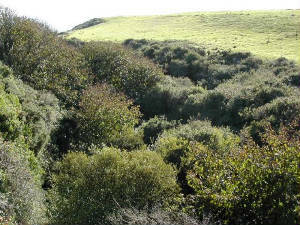 At the east margin of Brownstown Head, a stream down to Coolum Cove flows through an impressive, densely vegetated, steep-sided glen, which can be viewed from above in places. Towards its north end, the glen closes in and the stream is bordered by dense, but more accessible willow and thorn scrub. Access is by a rather long walk along the cliff-top west of Brazen Head, or, more easily, along a track running east from the ‘main road’ further back along the Head. 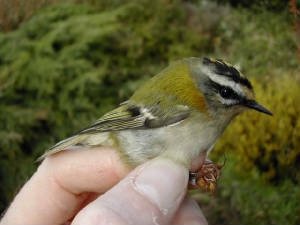 Species recorded include Wryneck, Ring Ouzel, Lesser Whitethroat, Reed, Yellow-browed & Greenish Warbler, Firecrest, Golden Oriole, and Hawfinch. Field-margins and scrub back along the 'main road' from the head (Woodchat Shrike has occurred in spring) and gardens and scrub at the NW side of the head (overlooking the NE corner of Tramore Bay) are also worth checking if time allows. Apart from migrant species, locally-breeding passerines present include Chough, Stonechat, Reed Bunting, and cliff-nesting House Martins. Good numbers of thrushes may occur in winter, along with waders in the fields. Birds of prey are regular, including fairly frequent sightings of Merlin in autumn and occasional Hen Harrier and Short-eared Owl. In winter, the western cliffs of Brownstown provide a good vantage point, in calm conditions, from which to scan for divers and Common Scoters in Tramore Bay.